April 26th: Some of the spices in our kitchen. I keep them in old olive jars, and that way they look terribly photogenic. 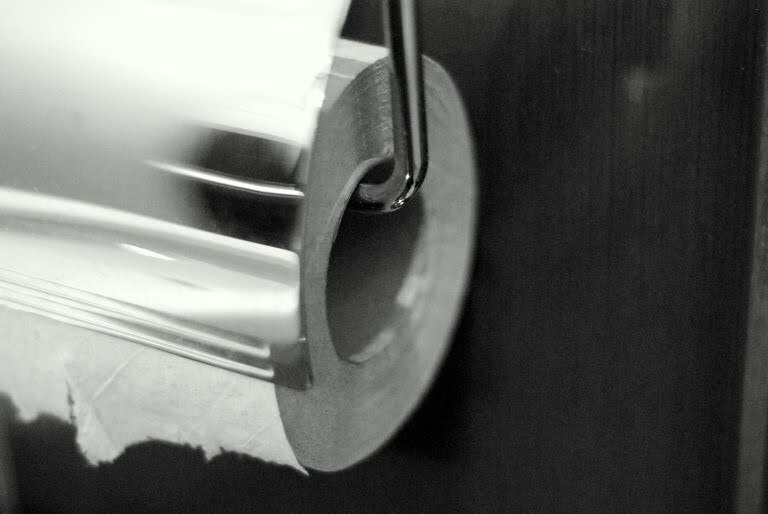 April 27th: The toilet paper roll in our bathroom. Camouflaged with that metal thing. (And sure enough, the bidet made its way into the Leftovers). April 28th: I was grading some papers this afternoon and listening to music on my headphones (there was a lot of lightning, so I had to turn off the electronic stuff). I like the leftover picture of my head, but that seemed a bit egotistical to put another self-portrait of me in such a short time, especially one where I’m in need of a shave. Plus, I like the blue in this picture. I have no idea why it came out blue, since both the curtain and light coming through it were both white at the time. April 29th: The fire station in Palmares. The color is about as subtle as a kick to the nuts, but I suppose it’s a good color for people who associate themselves with fire. April 30th: There was a little festival coming up in Berlin, so they hung this sign in front of our house. May 1st: My brother-in-law Arnoldo helping us cut down a stump. The saw I had just wasn’t cutting it. All of my in-laws have been great by helping us out with things at our place, and it’s nice to live close to people we know and like. May 2nd: A paint-by-numbers that my brother Paul gave us, and which Angela did most of (I worked on about 3% of it). It turned out pretty cool. Thanks, Paul! May 3rd: My globe. I tried to get a similar picture a while ago, but the light in that one wasn’t good since it was evening. I think this is a bit better. May 4th: Still progressing with the paint on the Formerly Crappy Casita… at about the same rate the country itself is progressing, actually. To see more pictures of the Formerly Crappy Casita, as well as other stuff from the last nine days, check out the Leftovers. So, we’re caught up. Thanks so much for reading, and have a great day! Damn. Maybe I’ll have to give you the other paint-by-number as well since I still haven’t even finished that one. You need your own dual-tigers. One for the banjo, the other for the gee-tar.